Jim Leap, an organic farmer in Aromas, California, had his first introduction to fracking a year ago when a bunch of large trucks showed up at his property and workers started putting out data loggers. When he asked what was they were doing, he was told that they were mapping earthquake faults. Hydraulic fracturing is a technique used in fossil fuel extraction whereby fresh water mixed with sand and chemicals is injected into a well at high pressure to break up shale formations, releasing oil and gas. In this intensive process, the risks to farming, public health, and the environment are multifold. Frack jobs require millions of gallons of water, a major issue in this arid state. Fracking can also pollute water through chemical spills, well casing failures, migration of fracking fluids, seepage of toxic underground chemicals such as lead and arsenic into aquifers, and improper disposal of wastewater. Illnesses due to water and air pollution have been documented in rural communities where fracking has occurred, and the impacts on agricultural production are emerging. Meat and dairy operations have been most immediately affected. As panel moderator and journalist Twilight Greenaway pointed out, a Cornell University study released last year linked decreased herd sizes from illnesses, death, and reproductive failures with exposure to fracking fluids. In response to these threats, communities are rallying to bring public attention to fracking, particularly in the Northeast. The New York State Assembly recently proposed a two-year moratorium while the risks are still being studied, though it has yet to pass. At the grassroots level, chefs, farmers, and other food professionals have formed the Chefs of Marcellus to campaign against fracking in the Marcellus Shale. In Brooklyn, the Park Slope Food Co-op organized a letter-writing campaign, saying that they will not buy from farms where fracking is taking place. “I think the food community in New York has played a huge role in what’s happened there,” said Greenaway. In California, fracking has been taking place for decades with little public awareness. California has the largest oil shale reserves in the country, and in the Monterey Shale alone, there are some 15 billion barrels of recoverable oil, noted Siegel. According to FracFocus, a voluntary registry for oil companies, fracking is happening in at least nine counties in the state, with more than 1,000 wells reported as fracked since the beginning of 2011. The Department of Conservation is working on upgrading their data collection systems and revising state regulations, though anti-fracking organizations like the Center for Biological Diversity insist that the revisions are still too weak, since they don’t require full public disclosure of fracking chemicals. “If you don’t have the first step of disclosure, there’s no way you can ensure protection,” said Siegel. As oil companies set their sights on California’s untapped oil reserves, public efforts to regulate the industry are slowly gaining momentum. In the last year, about a dozen bills have been introduced at the state level to regulate or ban the practice; however, most of them have died in the legislature, with much of the opposition coming from legislators who accepted campaign contributions from oil interest groups. 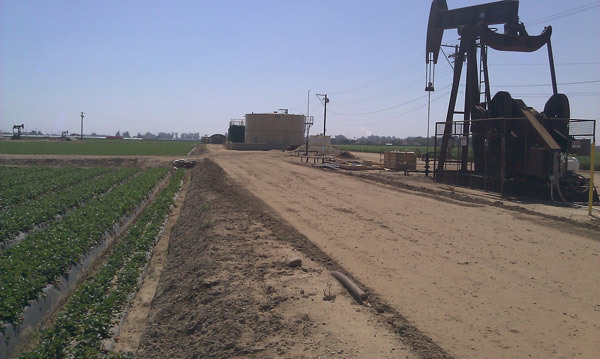 Farmers like Leap are starting educate themselves about the potential impacts of fracking on their watershed and communities, but he has been disappointed that the looming threat of oil conquest has yet to sound alarms throughout California’s agriculture community. Many farmers are reluctant to advocate for new regulations or get embroiled in a battle that doesn’t pose a direct threat, he noted. Some farmers might even welcome the prospect of additional income by leasing mineral rights to oil companies, despite the long-term environmental and health risks. In Leap’s own San Benito County, grassroots efforts to regulate fracking are gaining ground. He helped organize a group called Aromas Cares for the Environment to further public education about fracking and water issues and put pressure on the County Supervisors to revise outdated oil and gas well ordinances. “I really believe it’s just the beginning. We’re going to have to be diligent and watchful,” he said. Oil derrick photo by R.L. Miller. 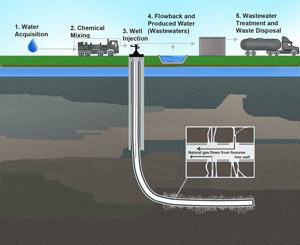 Fracking water cycle illustration by the United States Environmental Protection Agency. 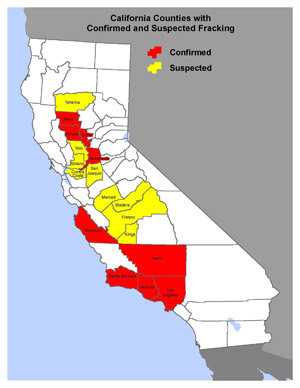 California map by Center for Biological Diversity.